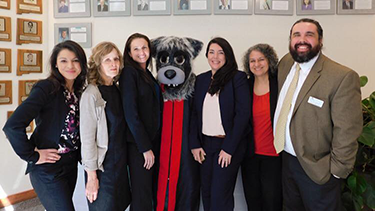 The Office of Student & Career Services team gets together with Lobo Louie at a recent event. The team includes (l to r): Desirae Ramirez, Nancy Huffstutler, Heather Harrigan, Quiana Salazar-King, Beth Kaimowitz, and James Simermeyer. The range of services offered includes one-on-one advice on course selection, assistance with personal issues, academic success and job skills workshops, on-campus interviews, and much more. During the fall 2017 semester alone, the department recruited over 100 employers to participate in the annual Fall Recruiting program and coordinated nearly 50 career guidance and academic support programs. The office also offers ongoing wellness support to address health concerns, promote a positive lifestyle, and assist with personal and professional issues and provides strategic academic and bar support. 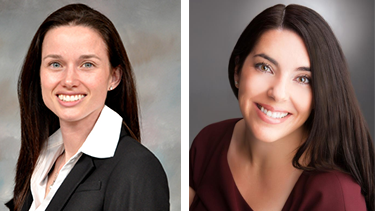 Student and Career Services Assistant Dean Heather Harrigan and Assistant Director Quiana Salazar-King help students become their own best advocates for their legal careers. Starting when students are in their first year of law school, Student & Career Services provides ongoing career and professional development advice and information to students and graduates. Heather Harrigan, Assistant Dean, encourages students to take ownership over their own professional development and stresses the importance of building a professional network and relationships. One of the most effective ways to build a professional network during law school is to gain practical experience where students collaborate with licensed attorneys on actual client matters. Due to the generosity of the W.K. Kellogg Foundation, in the past year the law school added alumnus James Simermeyer to the team as Assistant Director of Diversity and Public Interest (a position shared with the Office of Admissions). In this role, Simermeyer has fostered important relationships with New Mexico’s non-profits and various affinity groups to help close the access to justice gap for vulnerable children and families as well as address racial justice issues here in New Mexico. Extensive programs are offered each semester to provide students with a variety of seminars and experts from many areas of the legal profession. In the fall semester alone, the Office of Student & Career Services offered 31 professional or career-focused seminars and events. Influential speakers from both the public and private sectors have spoken to students about the diversity of legal careers available to them include Bernalillo County District Attorney Raúl Torrez, members of the UNM Law alumni community who have served as judicial clerks, attorneys from 18 of New Mexico’s legal non-profits, members of the State Bar’s Committee for Women in the Legal Profession (co-sponsored with the Women’s Law Caucus), members of the State Bar Committee on Diversity in the Legal Profession including Morris Chavez, representatives from the Central Intelligence Agency, representatives from New Mexico’s LGBTQ legal community, attorneys from Earthjustice, and the director of the State Bar’s Entrepreneurs in Community Lawyering program. In recent years, Career Services has significantly increased student connectivity with the legal market. In just a few years, the number of employers participating in the school’s On Campus Interview programs has increased from 10 to over 100 employers. While much of the work related to student services and academic success is by its nature one-on-one, the office presented 10 student support sessions and 9 academic success sessions, totaling nearly 50 seminars and panels for students to foster their own professional development. Harrigan was sure to add that “of course none of this would be possible without the invaluable work and dedication of Desirae Ramirez”, the office’s Coordinator. The advisors at UNM School of Law Office of Student & Career Services want students to keep their values in mind as they develop their professional identity and encounter challenges in law school. When in doubt, students are encouraged to read their personal statements from their law school application. In searching for a job and building a professional identity, students are urged to hold on to who they are and their long-term personal and professional goals. Throughout the year, the Office of Student & Career Services continues to support students and plan programs to cultivate a professional identity and career path that reflects their own core values and looks forward to working with students individually to develop a personalized development plan.